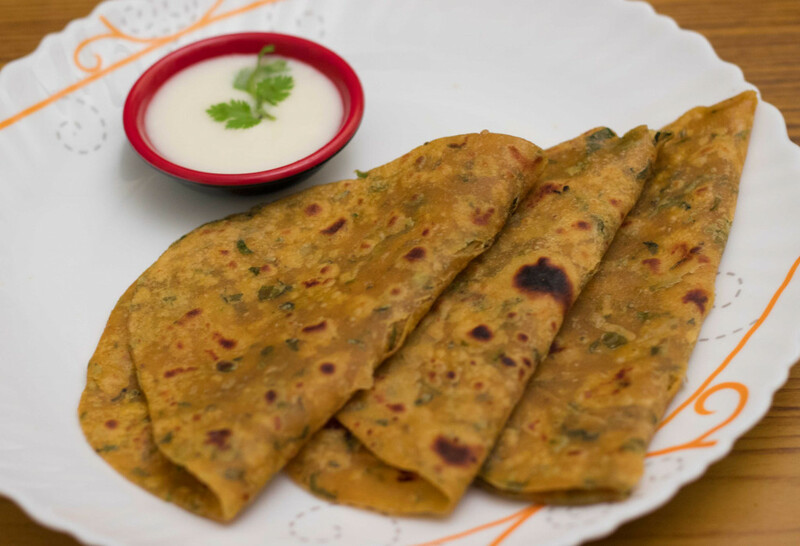 Dhaba Style Methi Paratha is a flat bread that is stuffed with finely chopped fenugreek leaves. This is a flavourful healthy Indian breakfast item made out of whole wheat flour, fenugreek leaves, and few spices. A great option to carry in tiffins for lunch too! Take a large bowl, and add wheat flour, chopped methi leaves, curd, turmeric, chilli, cumin powders, ginger paste, ajwain, salt as needed and mix well. Now add water and knead to form a soft dough. Keep covered with a cloth and leave to rest for about 30 minutes. After 30 minutes, divide the dough into lemon sized balls. Take one ball, place on a flat dusted surface and roll out with a rolling pin. Heat a tawa, place the rolled out paratha and add some oil or ghee on it. Wait for one minute for one side to cook, then turn over. Ensure that both sides are cooked and lightly browned. Repeat the same with all the dough balls. Keep warm in a casserole and serve with some raita and vegetable curry. For added softness, you can add mashed potatoes into the dough mix. If you are preparing this dish for small children, you can reduce the chilli powder also. For those who don't like the strong flavour of methi, reduce it by half and try it!